In a typical year, I would make my first West Virginia/Back Roads journey in early May. But so far this year I’ve made two trips, one in January and one in March. 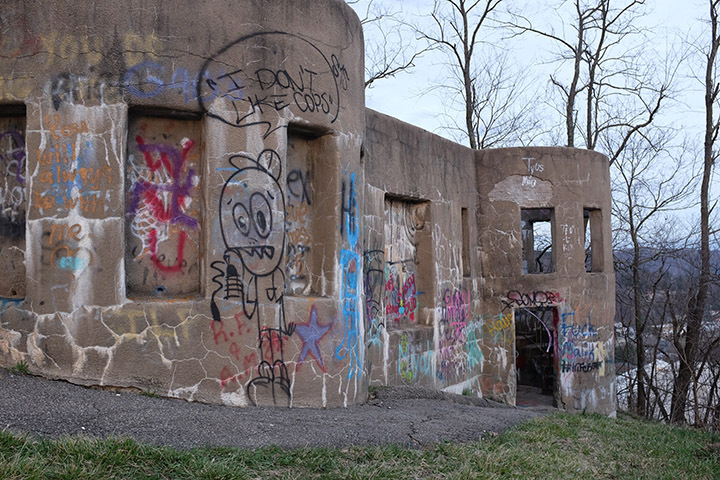 Wheeling’s castle at Wheeling Hill is an urban version of the castle at Berkeley Springs. The January trip, to the Eastern Panhandle, was during a weekend when the temperature on Saturday was 60 degrees and fell to near zero by Monday morning. It was so cold, I chose not to walk around my favorite place in the world, Harpers Ferry, that morning. My old bones feel the cold more acutely these days, it seems. My March trip to the Northern Panhandle was on a Saturday. It’s about 100 miles from my house to the tip of W.Va., Chester. After all these years, I still feel a sense of relief, of coming home, whenever I cross that state line heading south, and a twinge of sadness when my front tires hit that Buckeye pavement. The weather Saturday was perfect. When I left home, the trees were weeping with the frost melting from their branches; there was golden steam everywhere. I could have passed for a May morning. Within three hours, I was in Wellsburg and Highland Springs Farm, where I was greeted by Cooper, a pot-bellied pig who was coming back from his morning walk. 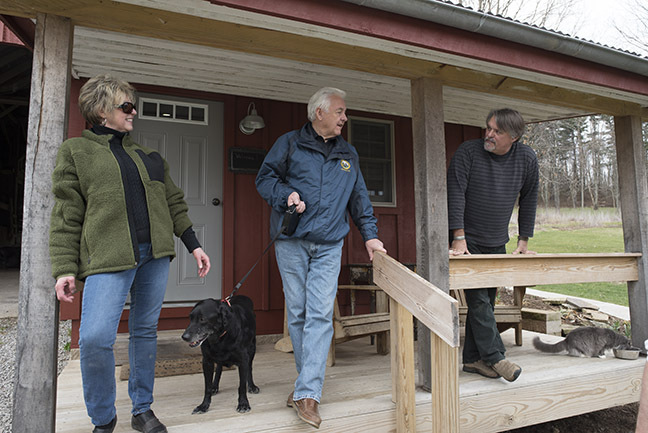 WV Department of Agriculture Commissioner Walt Helmick and his wife Rita Fay talk to Chatman Neely (right) on the porch of the bed and breakfast room where the couple stayed the night before. Barn With Inn has three rooms, one in a hay loft, one in a former horse stall and one in the innkeepers’ home. The innkeepers were expecting a state dignitary, Walt Helmick, the commissioner of agriculture, and agreed to give me a tour while we awaited the commissioner’s arrival. I won’t go into details about the farm except to say these gentlemen, Harry Sanford and Chatman Neely, have assembled a near-perfect repose for animals and people using mostly reclaimed materials (as in an old log barn for the frame of their dining room and a discarded pig pen for their dogs’ condo). They operate the Barn With Inn bed and breakfast on the property. You can stay in a loft room in the barn and look out the window into the animals’ stalls, take an outdoor shower and enjoy West Virginia sourced appetizers and drinks at night and eggs straight from the hen house in the morning. Read more about them at the website. It was a real pleasure meeting Walt Helmick, his wife and their staff. They were friendly and down-to-earth folks, the kind of people you’d like to find as your neighbors at a bed and breakfast or on a three-hour tour. And Chatman and Harry were equally hospitable, as well as their assortment of cats and dogs, all of them adopted (Harry’s a vet so a lot of their “livestock” comes in as tough-luck cases at the clinic). Britney Hervey Farris and Charlie Farris were waiting for me at their farm. 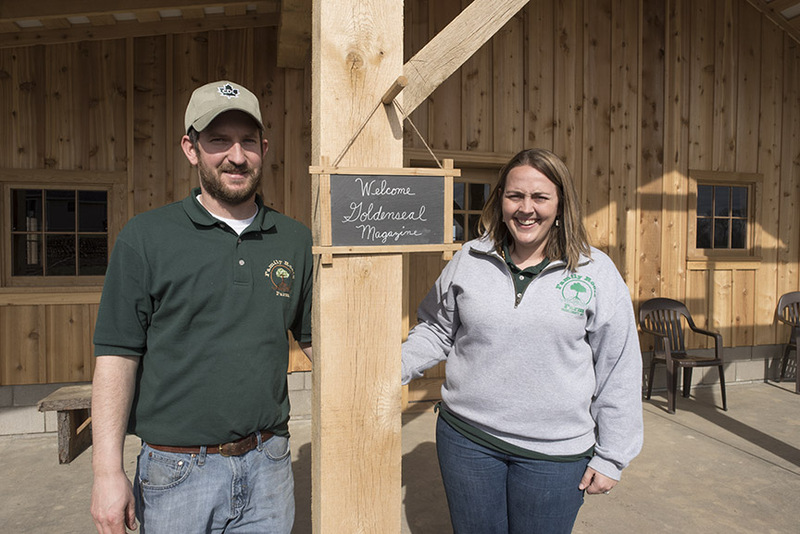 Married just three years, this young couple is building a farm for the 21st century on the farmland that Britney’s ancestors, the Herveys, first settled on in 1770. Their specialty is maple syrup, and although they’ve been at it just a few years, their maple sugar won best in the world at an international competition in 2015. Their maple syrup received a perfect score. They’re branching beyond maple trees to sorghum, sweet corn and other vegetables. Last year they planted five acres of vegetables and this year they’re shooting for 10 acres. And they both work full-time jobs. Hopefully my editor will find their stories worthwhile and you can read more about them in a future Back Roads column in Goldenseal. After wrapping up at Family Roots, I was ready for lunch/dinner. I went to my favorite restaurant in Wheeling, Coleman’s, and ate the fish sandwich and fries. Yes, I am a vegetarian, but once in a very great while, as in when I’m in Wheeling, I do eat fish. Coleman’s is the only fish I’ll eat. 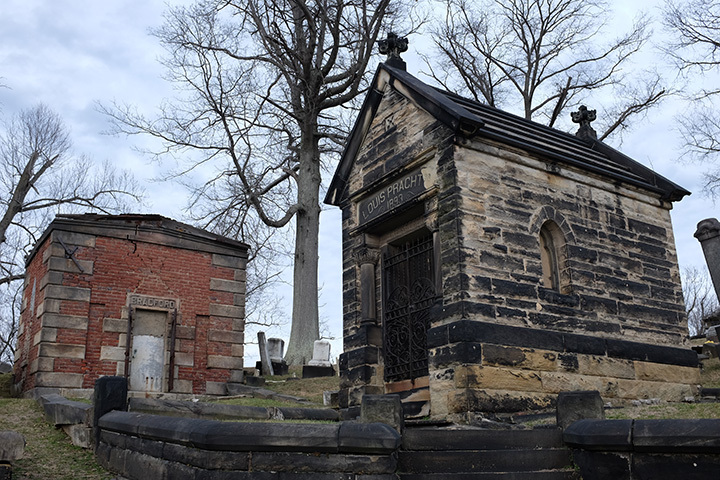 Mount Wood cemetery is a rural cemetery that overlooks the city. Next stop, Wheeling Hill, Mount Wood Cemetery and the castle. The cemetery is amazing. Built on a steep hill, the top is reserved for the movers and shakers of 19th-century Wheeling. My Goldenseal Back Roads story will feature one of these fascinating residents. Descending the slope of the rural cemetery, the graves become more prosaic, the obelisks give way to broken sandstone tablets. At the base is the Jewish cemetery. Across the street, at the overlook/castle, there is a great view of the Ohio River and the city. The magic hour, when the light takes on a beautiful quality and bathes the city in blue, was rolling across the streets. It was a perfect time for a walk with my little Fuji X100T, a digital rangefinder with a fixed 23mm, effective 35mm, lens. I looked for Wheeling’s most famous citizen, Moon Dog, but he was not patrolling, at least not yet. As the lights on the suspension bridge came on, I walked on the bridge toward Wheeling Island and was lucky enough to see a tow boat and barges heading down river. I positioned myself to take a series of pictures. The entourage slipped past Wheeling Island, then followed the strings of industrial and residential lights toward Moundsville, Cincinnati and perhaps Nashville. Their destiny was downriver, mine was to follow the river north, to Chester, away from the mountains and that inexplicable sense of peace I feel when I’m there, back to Ohio and The Feather Cottage.